In my last article “Are hemorrhoids part of your future?” I talked about getting more fiber in your diet to make you more regular and how important that is. I am not a doctor or a dietitian and not qualified to give medical advice but just wanted to share with you what works for me. So I decided it would be a great idea to share with you how I get more fiber in my diet with breakfast. I found a very creative way to get 18g of fiber in my breakfast and not only that, it taste great and keep me satisfied until lunch and beyond. I mix everything in a pan except for the blue berries and add 1 ¼ cup of water and mix well, put it on the stove and cook until it thickens up. Then I pour it into a bowl and mix in the frozen blue berries and that cools it down so you can enjoy it right a way. It taste great and keeps me full. Remember when you eat a lot of fiber at once, it is very important to drink water with it. 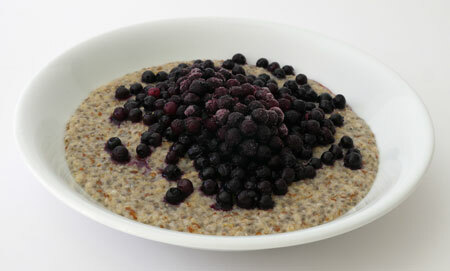 The blue berries will give it a sweet taste, so no need to add sugar that you don't need anyway and the flax seed meal will give it a bit of a nutty taste and the chia seeds have very mild nutty taste. The other great thing about this breakfast, it is very nutritious and also has about 12g of protein. The chia seeds are considered very healthy and also give you 2.9g of omega-3 fatty acids and flax seed also has omega-3 fatty acids. Hope you find this helpful, because it has really been great to keep me regular and also helped with my cholesterol along with a eating plan to include more fiber through out the day. A bidet seat will also help on the other end of things and keep you feeling fresh. As always, you should start small to make sure that you don't have an allergic reaction to any of the ingredients and consult with you doctor or dietitian first. We would love to hear your thoughts, so please leave a comment below and don’t forget to consider us for your next bidet toilet seat needs.